Your Doctor's Wife: Where' s My Doctor When I Need Him? As soon as it happened, I knew I was in trouble. However, if nothing else, the week prior I had just proven myself to be a tough doctor's wife, hadn't I? I still can't tell you exactly what happened. I didn't see it coming. Yet, despite my blindness, I forged on and continued with my garden chores with one hand over my injured eye and squinting out of my good eye. Why I continued on is beyond me. I was pretty certain I had left my right eyeball on the branch of one of our pine trees. After 20 more minutes of one-handed weeding pulling had passed, I realized my eyesight and pain was not going to miraculously fix itself. Now, considering I'm married to a doctor, you'd think that would be an easy task, wouldn't you? You see, I ended up going on vacation with our two youngest kids, my in-laws, and the dogs. Did you notice who's missing in that line-up? My poor man's parents flew half way across the country to visit him and Doc H had to stay behind to man his surgery department and patients, while we all ventured over 200 miles away to our retirement vacation home. I did my best to doctor myself. I flushed my eye with water and artificial tears. I held a cold compress to my eye. I went to bed early with the hopes I would wake up in the morning feeling as if nothing ever happened. That was the longest night of my life. No sleep. No rest. No over-night eye repair. Only intense and severe eye pain. At 6am, I phoned Doc H before he went into the OR for his first case of the day. I told him my tale, and began sobbing. I needed a doctor. 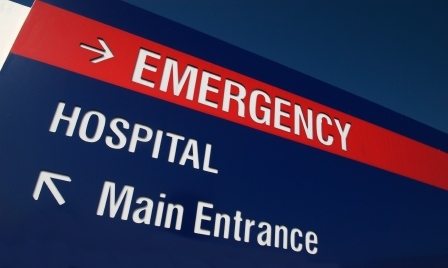 He advised I go to the local ER. I woke Doc H's father up and he jumped into action. I had multiple foreign objects removed from my eye and a badly injured cornea. The remainder of my "vacation" was spent in a dark room listening to anything on tv while on heavy narcotics... with no doctor in sight. Being injured or really sick when you`re alone is no piece of cake. I`ve been there - long distance relationship. Need I say more? Get better soon!!! Thanks! Feeling much better now! well, seeing as how I just started working as a nurse, I got a call from my husband's aunt a few weeks ago because her 14 year old son was running through the woods - at night - and gouged his eye with a tree branch. the real story came out: the 14 year old boys were shooting each other with BB guns in the dark woods while his mom was an hour away at a bar. 2 surgeries later and he can see a little better. Not so tough... I did cry! I don't know what it is about eyes...they creep me out. I couldn't imagine having stuff stuck in my eyeball or anything. My contacts give me enough grief! I'm so glad I've never had to wear contacts. They seem like so much work!! No!! Sorry to hear this story...feel better!! Thanks, Amy! Feeling much better! Oh no that sounds awful! Having something stuck in your eye is the absolute worst and this sounds 100x worse than that :( I hope you're feeling better now! Eyeball pain is horrendous! Who knew??!!! But, I'm doing well know. Thank you! Oh dear, I just came across your blog. I am a nurse for many years. I worked 13 years in OR. 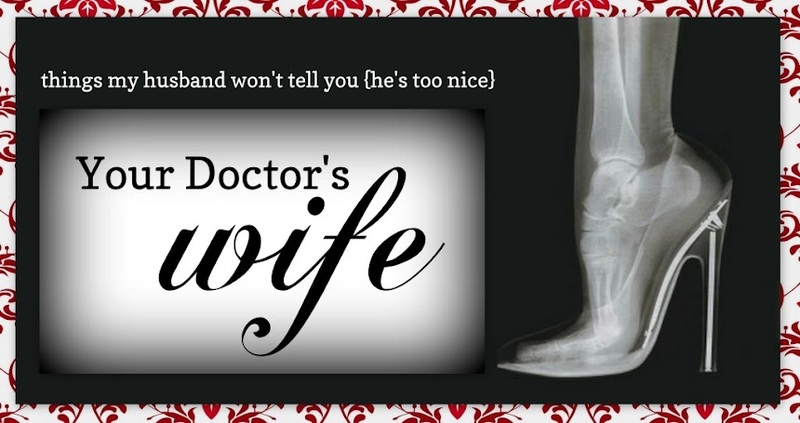 Just thinking the words "Doctor's Wife" is giving me a severe case of PTSD. I need a glass of wine and some expensive chocolate. Do you ever feel that way when you hear the words "the nurse"??? Ha! Thanks for the laugh!!! I've been a patient, so I really appreciate the awesome care I've received from nurses. I only have an adverse reaction when his pager goes off (or worse) our house phone rings at ungodly hours asking questions which he'd already answered in his orders. Ugh. Medicine is just rough... no matter what role you play! NEVER PLAY AROUND WITH YOUR EYES !!! Speaking as someone who is blind in one eye because I kept thinking " it will be better tomorrow ". Oh my!!! Thanks for the warning! I am guilty of always putting my own healthcare off... No good... I know.. I'm glad to hear that you are feeling better! You ARE a tough cookie - you continued to pull weeds with one eye - LOL ! !